Use this recipe from Mexico in my Kitchen to leave your family craving corn tortillas each and every night! Use a wooden bowl to mix the masa harina and water. Mix until the water is absorbed evenly and the dough forms a ball. Be sure that the dough consistency is not too wet and sticky, nor too dry and crumbly. Cover with a moist towel to prevent the dough from drying. Preheat a griddle or a heavy skillet to a medium flame. 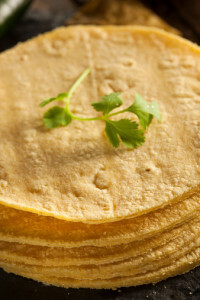 Using a tortilla press or a heavy dish plate, place a ball of the dough about 1 ½ inch in diameter (about the size of an egg) between the two plastic pieces and press to from a 6 inch round tortilla. Press the small ball of dough firmly with your fingers to form a patty between the pieces of plastic. After flattened, peel off the top layer of plastic. Lift the plastic with the pressed tortilla and place the dough in your hand closer to your fingers and carefully peel the bottom layer of plastic off. Place the tortilla on the griddle for 45 seconds to cook. The edges will begin to dry out. Turn over and continue to cook for 1 minute until brown patches form. Turn over and cook for another 15 seconds. The cooking time is about 2 minutes total. Cook until the tortilla begins to puff. Tap it lightly with your fingertips to allow it to puff evenly. Wrap with a napkin or clean towel and serve. These are just a few delicious examples of Mexican dishes with corn tortillas that you can make right in your own home. Come by one of our many Acapulcos Mexican Family Restaurant and Cantina locations across Massachusetts and enjoy an authentic Mexican meal!